It's a beautiful easter morning in Rocky Mountain National Park. A fresh coating of heavy wet spring snow covers the Ponderosa Pine trees and the boulders found along the hillsides of Moraine Park. 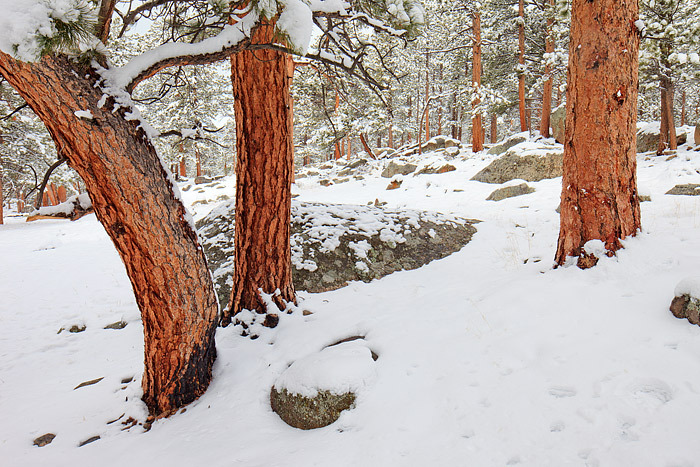 The wet snow does a great job making the red bark of the Ponderosa Pine tree's standout against the white backdrop of snow. Photo © copyright by Thomas Mangan.